The Ping color chart may look intimidating at first, but don’t be! It’s there to guide you in getting the best club for your sport. The goal in using the ping color chart is to help you determine the correct color code that’s most effective for your game. Having the correct customization for your golf club is important in impacting ball direction. The uprightness and flatness of your club all play a major role in improving your game. Golf shafts have a standard length. Depending on your height they may be too long or too short for you. On the top part of the ping color chart, find your height. Directly underneath you’ll see the adjustment you need to make on the shaft length. For example, if you’re height is between 5’2” to 5’4”, your shaft should be decreased by half an inch as suggested by the chart (-½”). If you’re height is between 5’7” to 6’1”, then a standard length shaft will work for you. By taking your overall height and wrist to floor measurement, you can see which colour band is right for your size. The Ping color chart features 12 color codes with varying uprightness and flatness. The colors range from Maroon (extremely upright) to Gold (extremely flat). If you intersect your height and your wrist to floor measurement, you’ll land at a color on the chart. This will tell you the lie angle that’s right for your build. Generally, the taller you are the more upright your club should be. In case your height and wrist to floor measurements is playing close to two different color codes, Ping suggests determining your typical ball flight during iron shots. It could be a fade, a slice, a draw, or a hook. For reducing your fade or slice, an upright color code is suggested. For reducing your hook or draw, a flatter color code will do. Still, if you wish to learn more about the Ping color chart and get more tailored recommendations for your clubs, don’t hesitate to talk to an authorized club fitter. 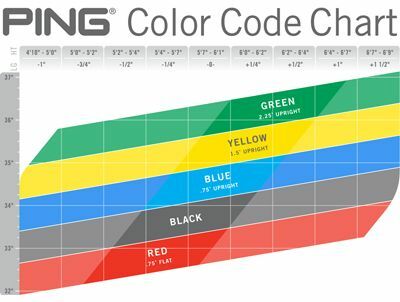 The goal of the Ping color code chart is to give you an idea of the best configuration for your golf clubs. Learning the right color code for you is important in improving your gameplay.